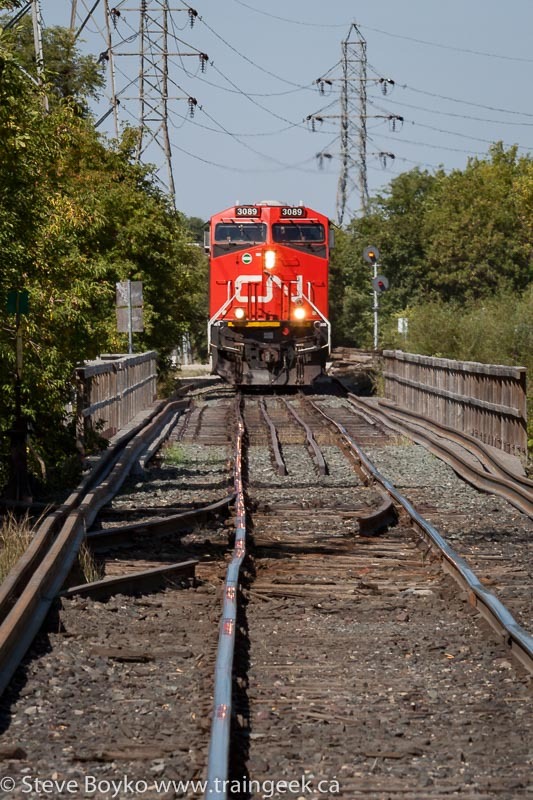 CN has a "Family Day" every year where they invite families of CN employees and CN retirees to a local yard for tours, games, food and fun. Often a train ride is involved and that's where my interest lies! This year the organizers in Winnipeg did something different. 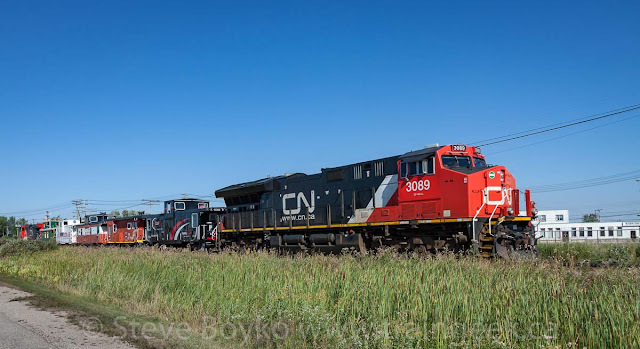 In past years CN ran a few passenger cars with locomotives on each end (2016 had two cars, an E unit and two of CN's newest units; 2014's was pretty much the same but only one new CN unit). 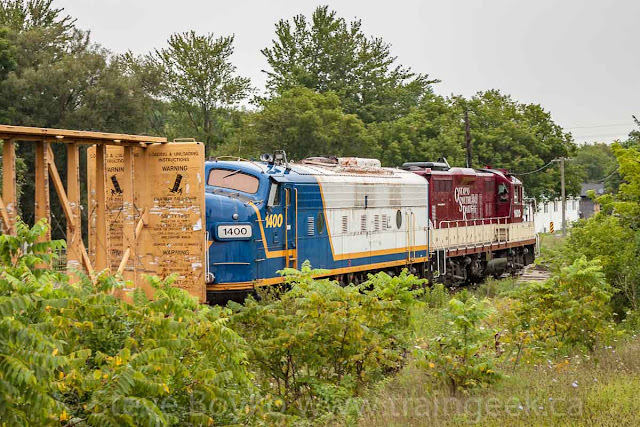 This year, the CN organizers gathered up five cabooses (cabeese?). 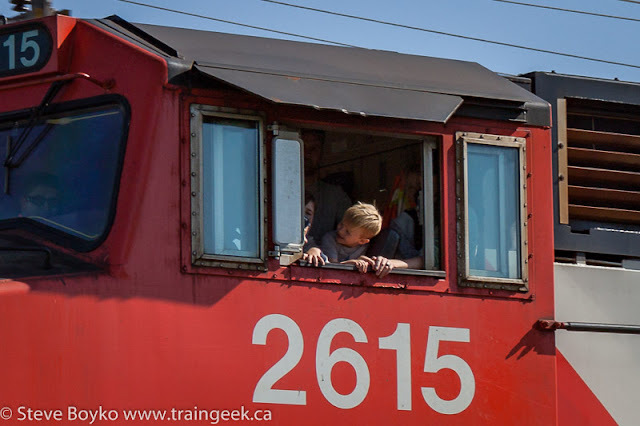 When did you last see five cabooses in a train? September 9, that's when I did! The train was scheduled to start running at 11 AM on the morning of September 9, 2017. I passed Symington Yard shortly before 11 and the train was there along with tents, bouncy castles, and a lot of automobiles going into the yard. 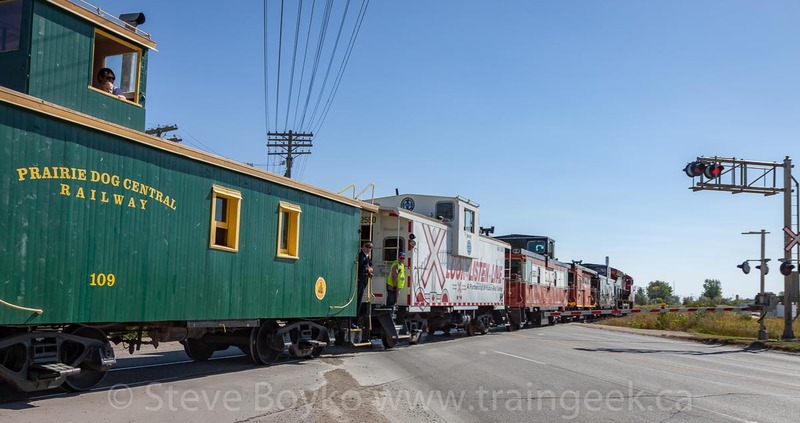 Like other years, the train was to head northwest up the St. Boniface spur to cross Archibald Street, then back into the yard again for the next run. I had some "favourite spots" but I wanted to try one or two different ones this time. I drove around and decided on some locations. 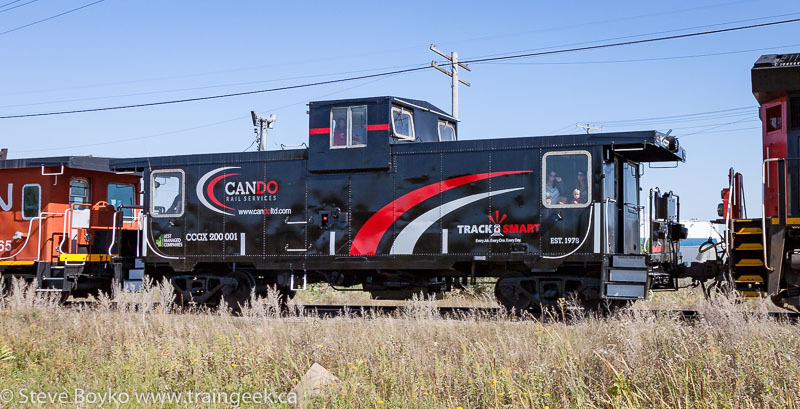 At Marion Street I ran into Taylor "the Cando Railfan", who was waiting there for the train. We chatted for a few minutes before I headed out. One shot I knew I wanted was the overpass over Lagimodiere Boulevard just outside the yard. I had seen Jack Hykaway's photo from last year and I knew I wanted to get that shot. I parked on Dawson Road and hoofed it over to set up for the shot. Right on time the train headed out at 11, with CN 2615 leading the five cabeese and CN 3089 on the rear. After the train passed, I knew I wasn't going to be able to drive to another spot, so I hustled back to Dawson Road and waited by Star Building Materials on the broken asphalt of the former highway 59 road. 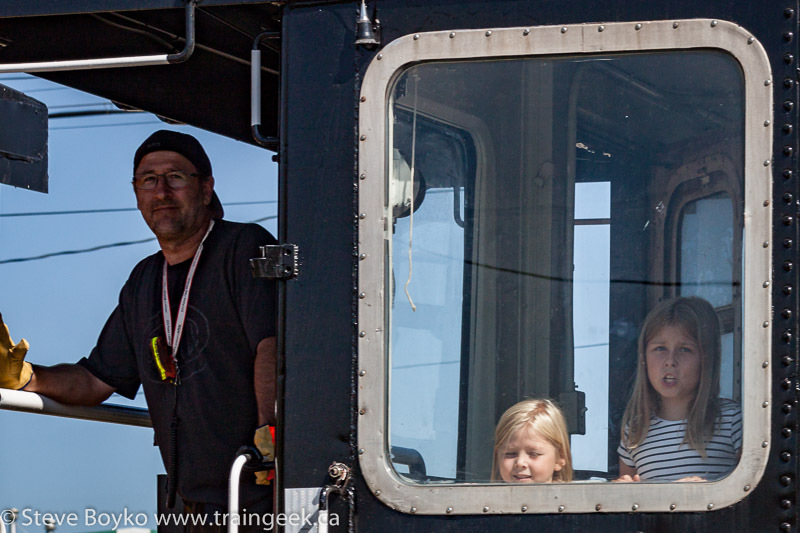 Fellow Winnipeg railfan Tim Burridge showed up with his daughter to photograph the train. 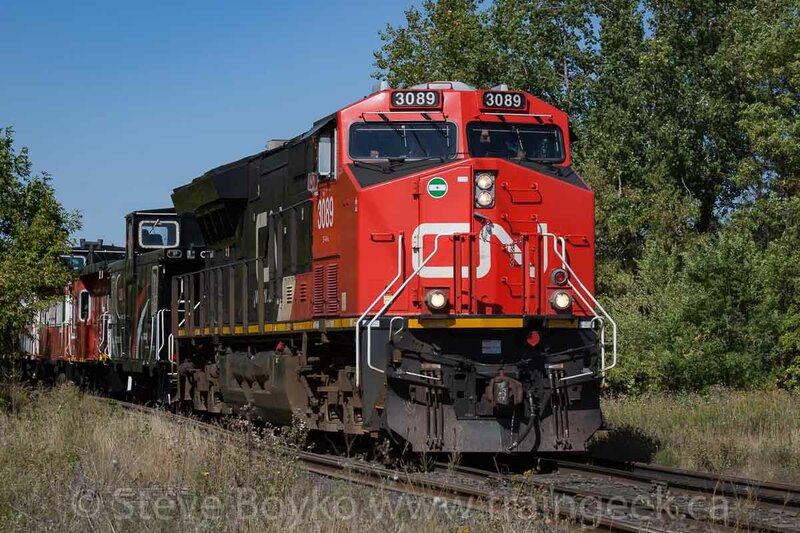 CN 3089 looked nice and clean leading on the way back. Freshly painted CCGX 200001 was looking nice. 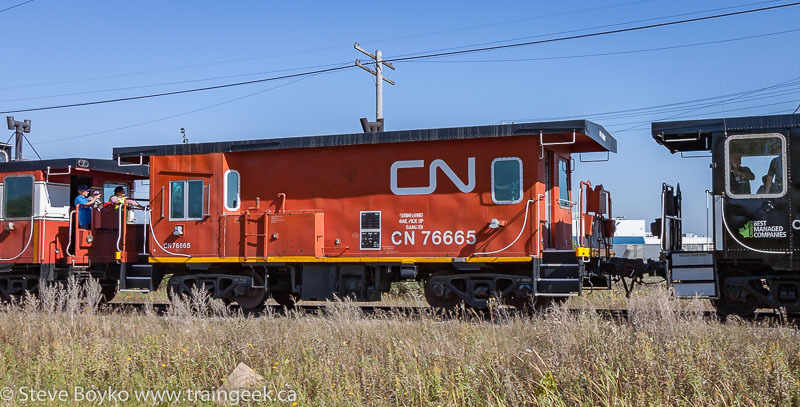 This is an ex CN caboose rebuilt from a boxcar by the Pointe-Saint-Charles (PSC) shops in 1976 as CN 79843. 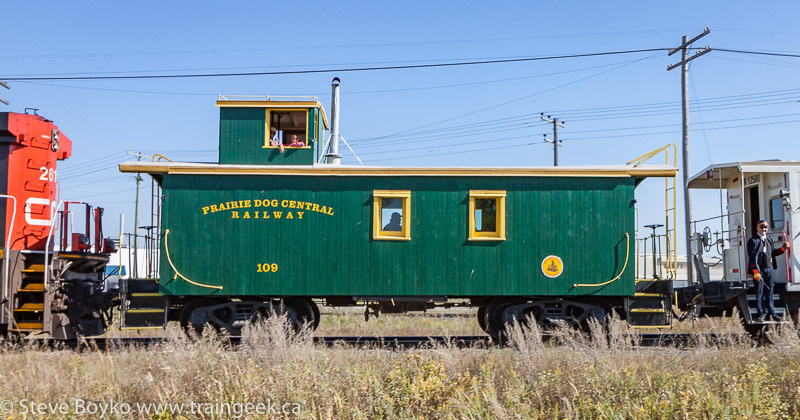 Rumour has it that this caboose is going to be mounted on a section of track at the CEMR shops in north Transcona in Winnipeg. 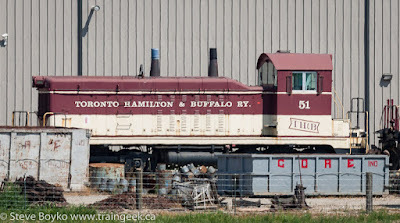 Next was this rare transfer caboose, CN 76665, another PSC product. I'm told this is one of only two active CN transfer cabeese. 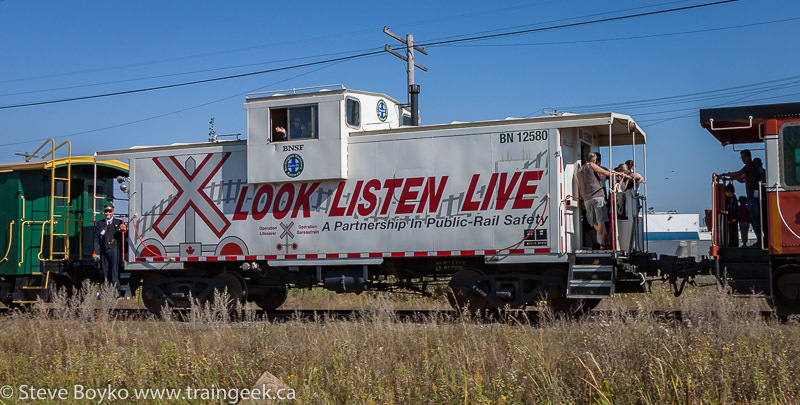 The Greater Winnipeg Water District contributed their sole caboose, GWWD 1360. I've never actually seen that caboose run! The last two cabooses have no CN heritage. 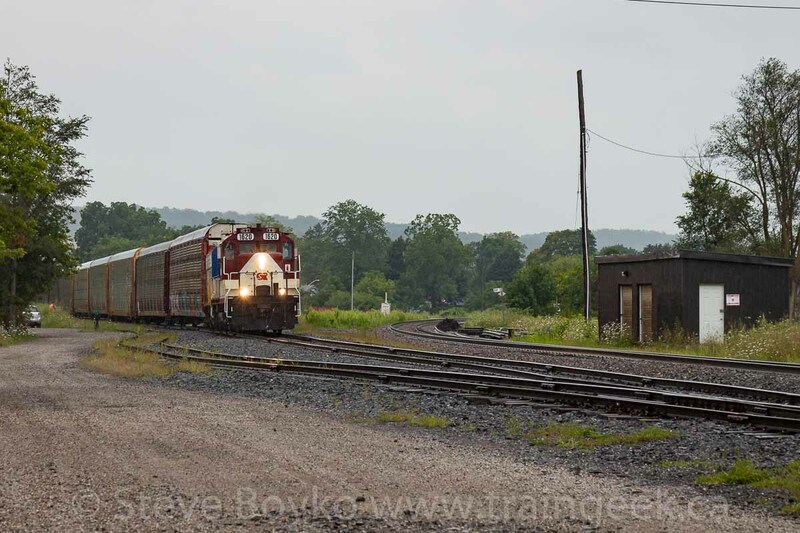 This one is Burlington Northern through and through. BN 12580 is a familiar sight to Winnipeg railfans, as it runs pretty much every day on the BNSF Manitoba freight train. Another rumour - I hear it's going to be repainted soon. Prairie Dog Central #109 was easily the oldest caboose on the train... also the only one with friction bearings! Both locomotive cabs were packed with happy riders! After the train passed, I relocated to the Marion Street crossing. The Marion Street crossing is one of the two major crossings on this section of the St. Boniface spur. Shot 3 was into the sun a bit, but I did the best I could. I decided to stay at Marion Street and shoot them coming back. The sun would be nice coming back. While I was waiting for them to return, I walked around to decide what composition I wanted. I saw this neat billboard and decided to include it in shot #4. This might be my favourite photo from the day. 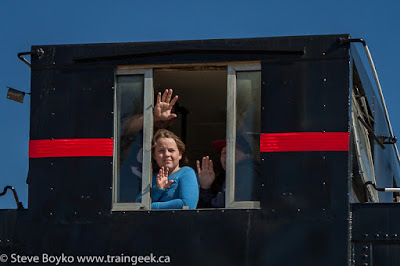 Another going-away shot, showing two of the CN volunteers - Mark and Christopher - on the caboose steps. One caboose, two cabooses, three cabooses... ah ah ah! I decided to head down to Archibald Street for the third run. 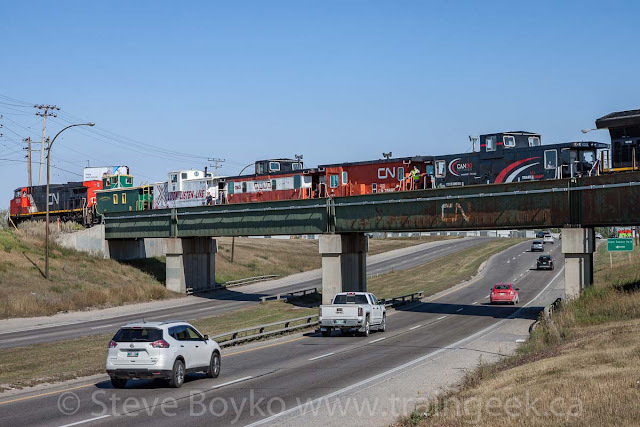 I knew some railfans in past years shot the train on the Seine River bridge after they crossed Archibald. I couldn't find any path down to get the shot, so I elected to wait at the crossing. The train passed by and crossed the bridge entirely. After a quick pause, the reverser was thrown and the train started rolling back. As the train started rolling, someone on a bicycle came along and stopped to the side, clearly waiting for the train to pass before he could walk across the bridge. The engineer gave him a couple of toots but he was undeterred. So that was the train! Big thanks to the many CN volunteers for the many hours they put in to organize this and staff it so the extended CN family could have a great day. A special thank you to Mark and Derrick for taking CN 4797 around Winnipeg to gather up all of the Winnipeg cabooses for the train! Lots of waves from the cupolas! 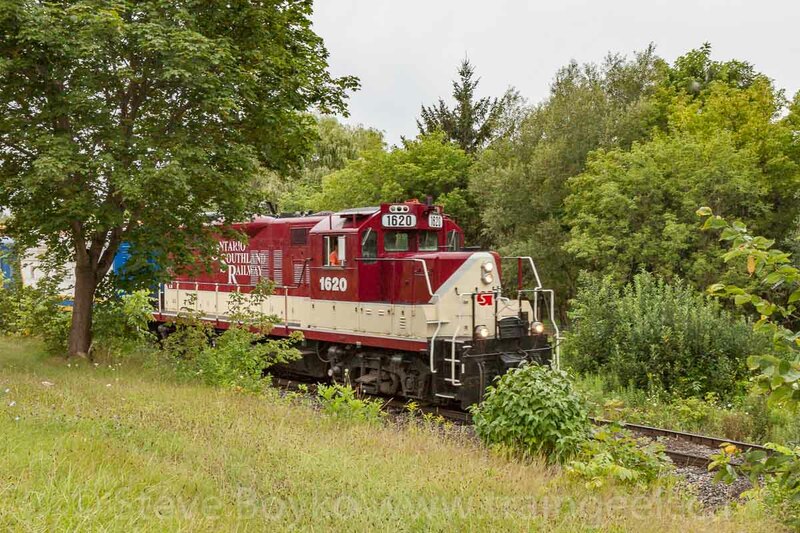 On August 17, 2017 I chased an Ontario Southland Railway from Ingersoll to Woodstock. In part 1 I followed the train from their shops in Salford to Ingersoll, where I promptly lost the train and eventually found it again. 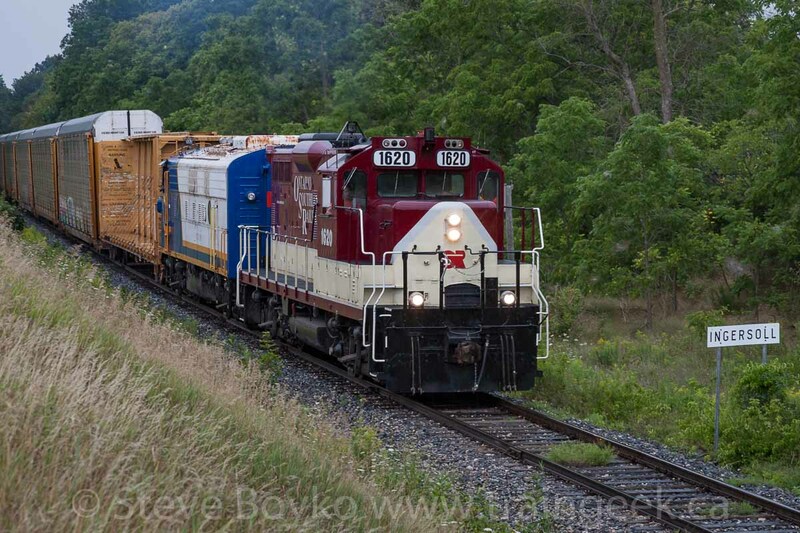 Here I describe the chase to Woodstock and the switching operations in Woodstock. 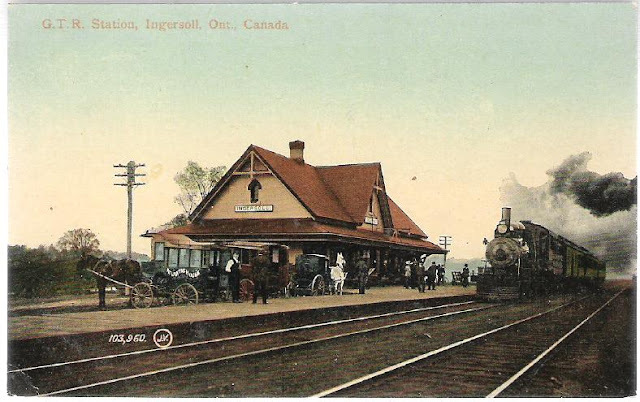 When I had driven into Ingersoll earlier in the chase, I had noted a spot along highway 9 where the Ingersoll railway sign was located indicating 1 mile to the station sign. I thought that would be a good location for a photo. Now that I was racing east, this was the time to stop there. I pulled off the road and walked across the road, in the rain, and waited by the guard rail for the train to come. I was about 90% sure I was in the right spot, but the other 10% of my brain said, "you're standing by the wrong tracks, and nothing will come." It didn't help that I heard the roar of a train going by while I was waiting. It must have been a CN train on the Dundas sub, but my confidence was diminished a bit more. Fortunately, I was by the right tracks and OSRX 1820 came around the bend. I took a few photos as the train approached. I'm not sure which of the following two photos I like more, so I'm sharing both of them. That Ontario Southland paint scheme is pretty sharp. I know it's inspired by the old Toronto, Hamilton and Buffalo scheme but it looks nice no matter where it came from. The light was low so I was using a low shutter speed, and I did a pan of the locomotives as they went by. I really like how this photo of 1400 turned out. I don't know what the speed limit on the St. Thomas subdivision is, but they were not crawling - nor were they doing 60 MPH. I hopped in my rental car and gave chase. Not knowing the area, I wasn't sure where to catch them next. I thought about the highway #6 crossing - easily accessible as it's just off highway 9 - but as I approached it I saw there was construction in the area and I didn't want to get involved in that. I took the next left, which turned out to be Domtar Line. 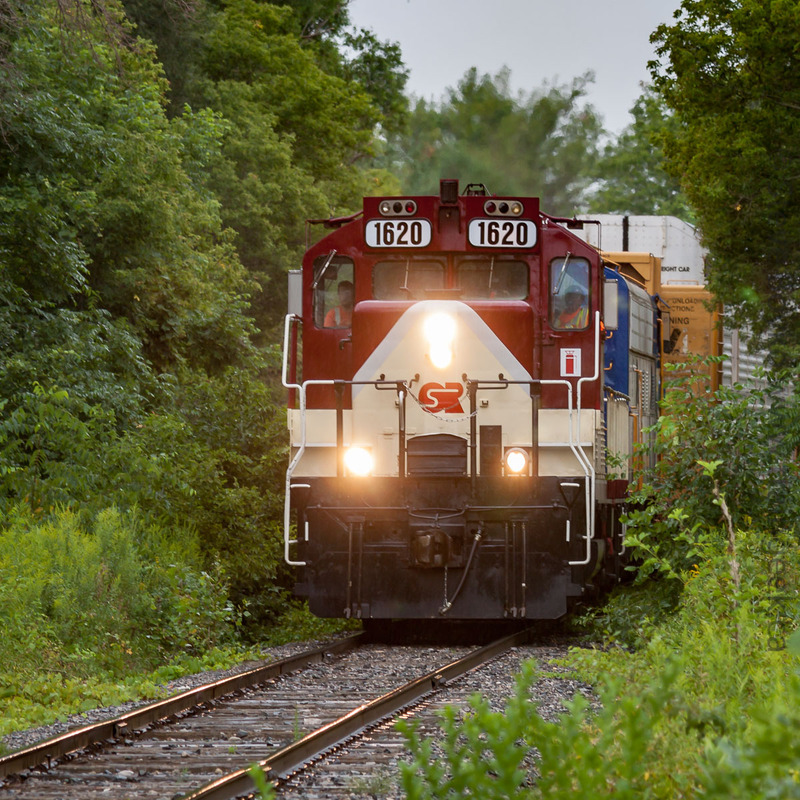 I liked seeing the train come through the foliage, but in retrospect, I probably should have been on the other side of the tracks. I used my "long lens" (70-200mm) and on the side I was on, I couldn't get a really long view without standing in the crossing, which is not safe. As I waited for the train to pass so I could get back to my car, I noted a railway bridge in the underbrush nearby that still has rails on it. I think this was part of the track that used to connect the nearby Domtar facility to the CP line. There is still track near the CN line but I don't think the facility that's there now gets any rail service. I shot video at the next two spots. The first was a very quick clip and at the second location, I made sure I got enough ahead of the train that I could get into position to record the entire train. The video's at the bottom of this post. After the two video spots, we were approaching Woodstock, another town I had never been in. 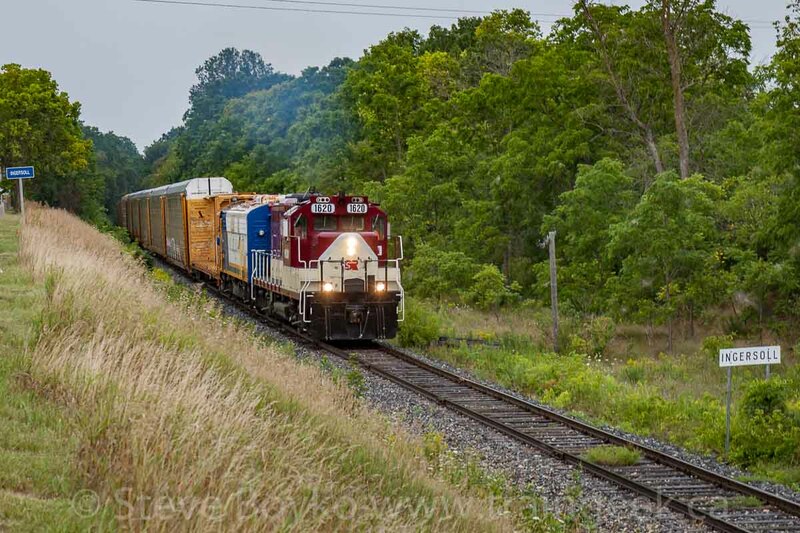 I knew that CN and CP/OSRX crossed and the highway goes right by the diamond. 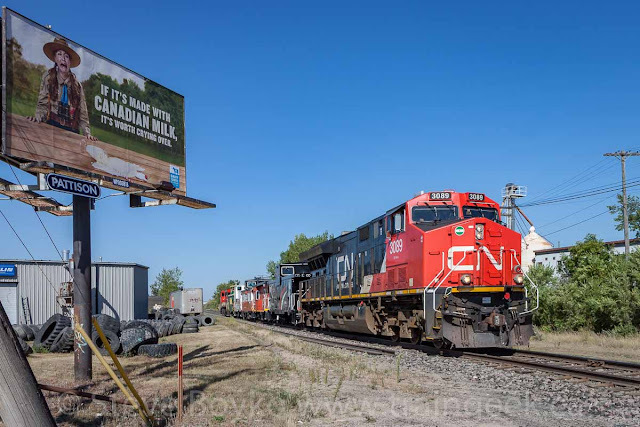 I decided I had enough time to grab a quick shot, so I crossed CN then quickly parked and ran over to get the shot. 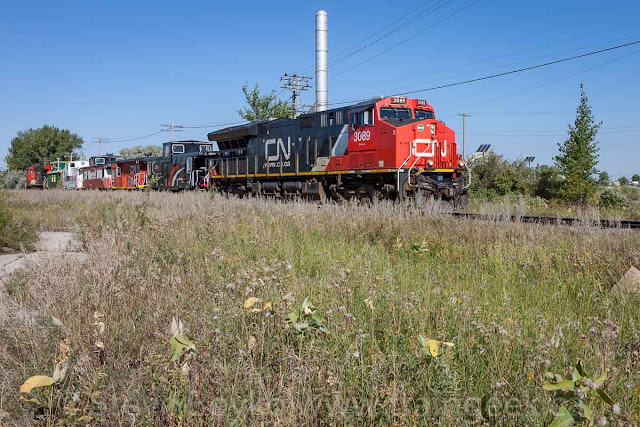 I've seen photos of the OSR at CN Carew by many railfan photographers. Now I have my own! As I wrote above, I had never been to Woodstock so I didn't know where to go. My vague memories of looking at the map told me that the Ontario Southland went north-northeast along the west edge of town. 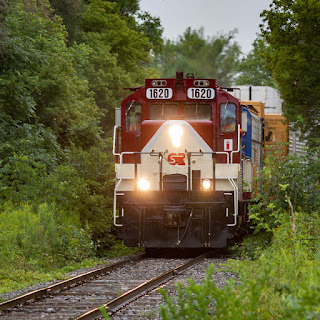 I followed the train as best I could and caught it at Dundas Street / highway 2. 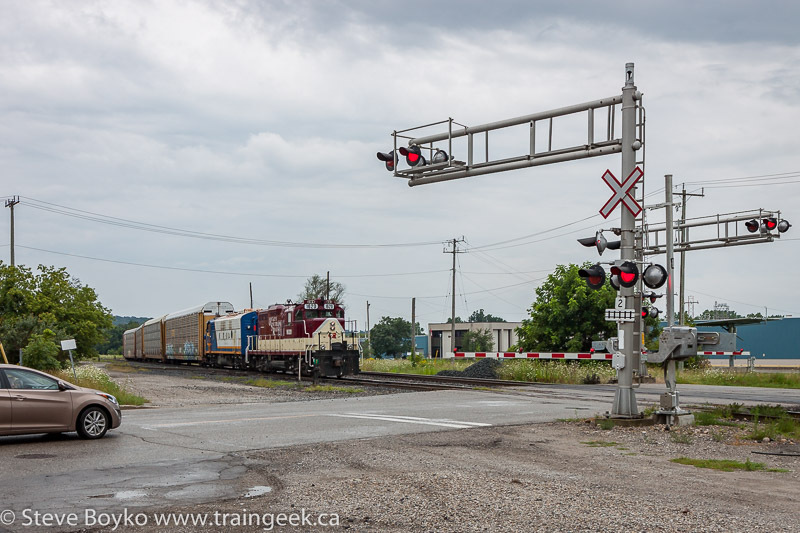 After the train passed, I kept going and got to the CP yard in Woodstock at the corner of Ingersoll Avenue and Tecumseh Street. They pulled up beside the (ex?) CP station there. Without much of a pause, they started to do some switching. There are a series of tracks south of Ingersoll Avenue and they started drilling those tracks, putting autoracks away. A longer distance photo of them at work. The CP main line curves off to the right. There are a few storage tracks behind the locomotive that they were stuffing cars into. The photo below might give a better indication of the operation. I took a lot of photos - probably too many - of the switching operations. That's probably enough to give you a flavour of the operation. After watching them switch for half an hour, I decided to duck out to see the VIA Rail station in Woodstock. I asked my phone to take me to the VIA Rail station, and it did so with no fuss or misdirection. Thank you! Woodstock has a very unique looking VIA Rail train station. This station was built by the Grand Trunk Railway in 1885. 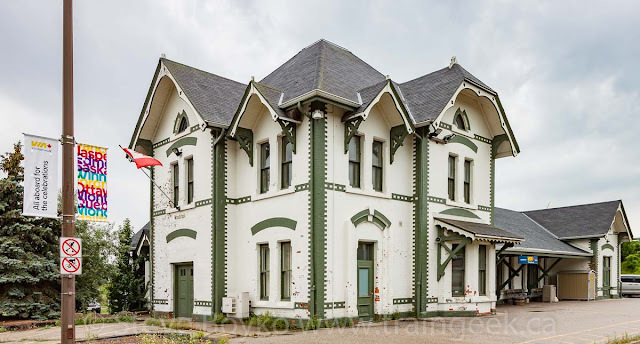 Unlike the Ingersoll station, the Woodstock station is protected by the federal Heritage Railway Stations Protection Act. There are three boxcars across from the station that are supposed to depict the past, present and future of railways in Woodstock. They are faded and have been defaced by the usual vandals so their message is a little unclear. There is an overpass near the station which would be a great place to view passing trains on the CN line. If you'd like to see a map of Woodstock, there's one in this Trains article about Woodstock from 2014. 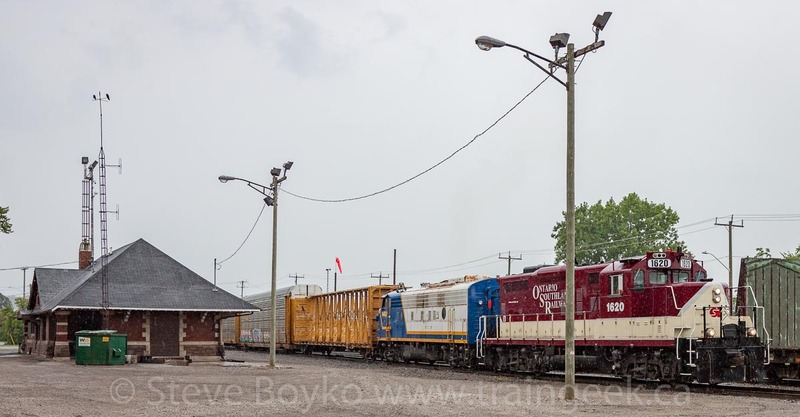 Here's a little video I put together - a bit at the Salford shop, two clips between Ingersoll and Woodstock, and some switching action in Woodstock. I went back to the CP station / Ontario Southland track and they were wrapping up shunting for a bit. I took this one last photo and then they tied the train down. The conductor said they needed to get a clearance from CP before they could go on the main and continue their work. I had to clear out to meet my son, so we shook hands and I went on my way. 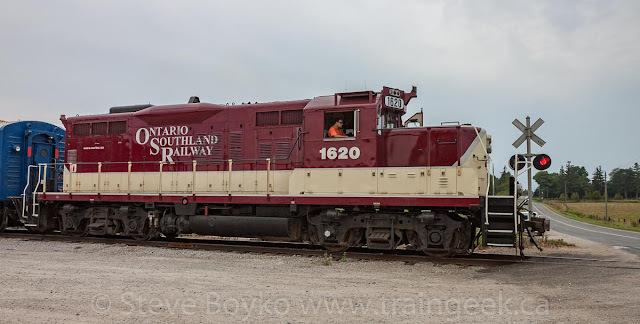 It was a great little chase and the Ontario Southland Railway is a great shortline with a great reputation, both with customers and with railfans. Highly recommended. As always, be safe and respect private property. 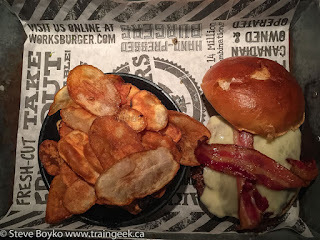 PS - I met up with my son and his girlfriend in Waterloo and we went to an early supper at The WORKS "Gourmet Burger Bistro". They make fantastic burgers - definitely worth visiting one of their many restaurants in Ontario. One item on my "bucket list" was checked off early in August when I finally saw the Ontario Southland Railway and part of its unique fleet of hard working diesel locomotives. 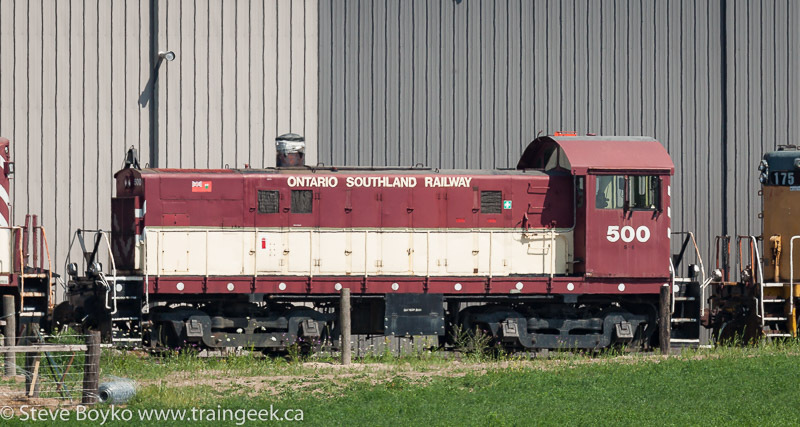 The Ontario Southland Railway was founded by Jeff Willsie, who is now the president of the company. The OSR started in April 1994, working the Petro-Canada lubricants refinery in Mississauga and hauling to Clarkson, Ontario. 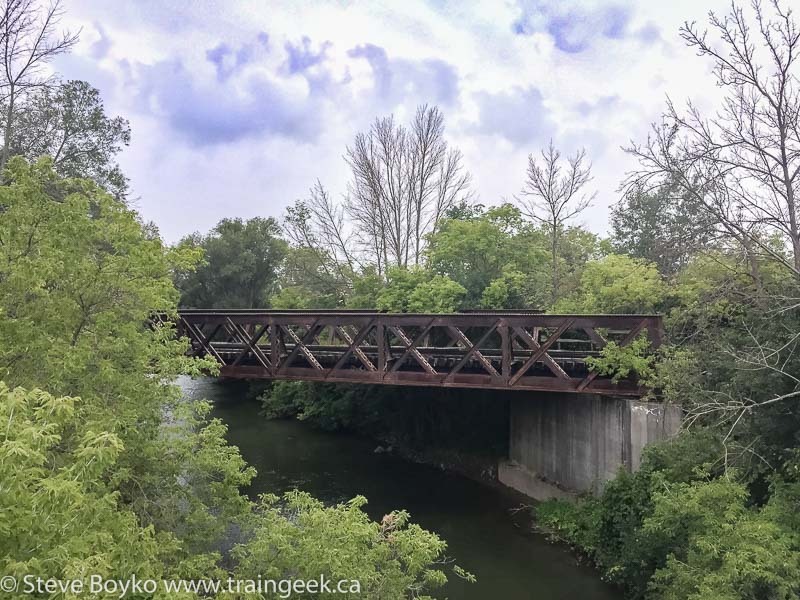 On January 1, 1998 it started operating the city-owned Guelph Junction Railway, and later it took over the CP Tillsonburg spur and the CP St. Thomas subdivision. Recently it started working the CN Cayuga subdivision as well. 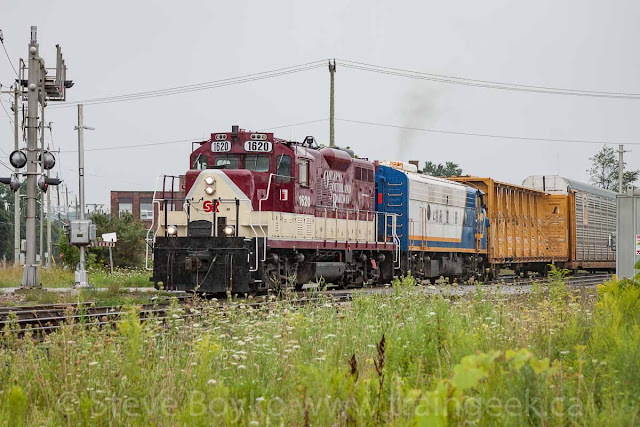 The OSR has a diverse collection of older locomotives, including three ex CN FP9 locomotives, several MLW units (RS-18, S-13, M420W, RS-23) and some EMD GP7s and GP9s. 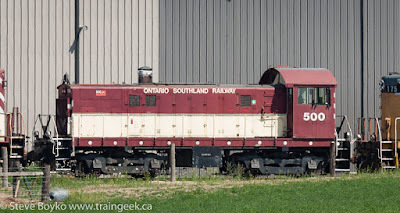 The Ontario Southland has been well photographed by the railfan community, and I wanted to get my own photos of this unique and friendly shortline. On August 16 I drove up from southern Ontario to Waterloo to visit my son and his girlfriend. Nick has been going to the University of Waterloo and has finished his class work. They were just about to move to New Brunswick and we arranged to meet just before they hit the road for the Maritimes. En route I ducked into Salford, Ontario for a very quick visit to the Ontario Southland Railway shop there. All was quiet when I came by. 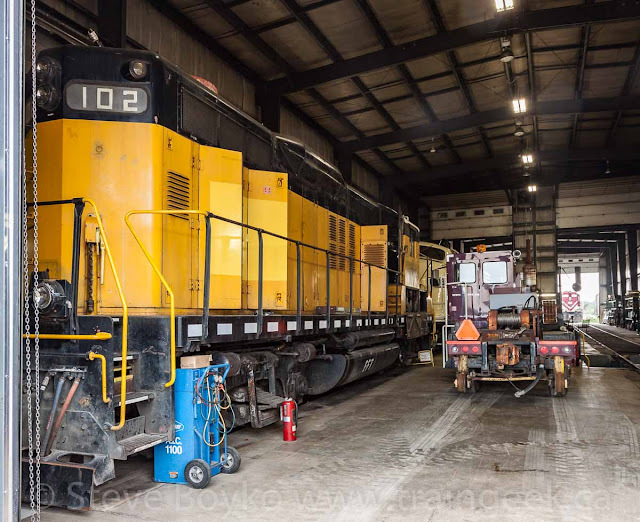 There was a "dead line" of locomotives on the shop track on the west side of the facility: CITX 6016, UP 9444, OSRX 175 (GP9), OSRX 500 (S-6), OSRX 183 (RS-18) and OSRX 51 (NW2u) with ex CP snowplow 401005. A little research shows that freshly repainted UP 9444 arrived in August 2016 for some work. I'm not sure why it's still there a year later! Not many MLW S-6 locomotives around! I was using my "long lens" (70-200mm) to get roster shots of each locomotive. It was a hot day so there's a bit of heat shimmer in the photos. 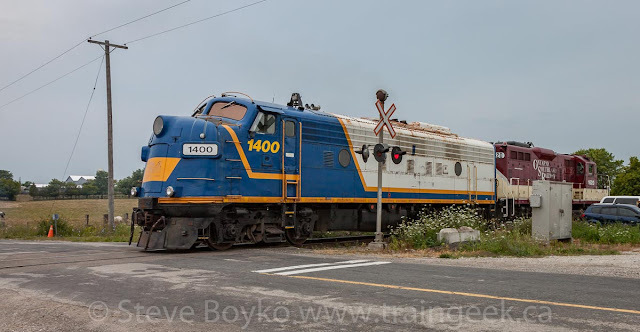 On the other side of the shops were OSRX 1594 (ex CP GP9) and one of the Ontario Southland's three "F" units, OSRX 1401 (ex CN, ex VIA, ex Raillink FP9u). After grabbing those photos, I kept on to Waterloo and met up with my son Nick and his girlfriend. 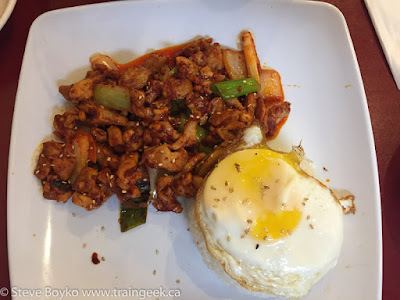 We wandered through Waterloo and had dinner at a lovely little Korean restaurant. No kimchi for me, though! I enjoyed the meal greatly. That egg... what the heck? Still tasty. 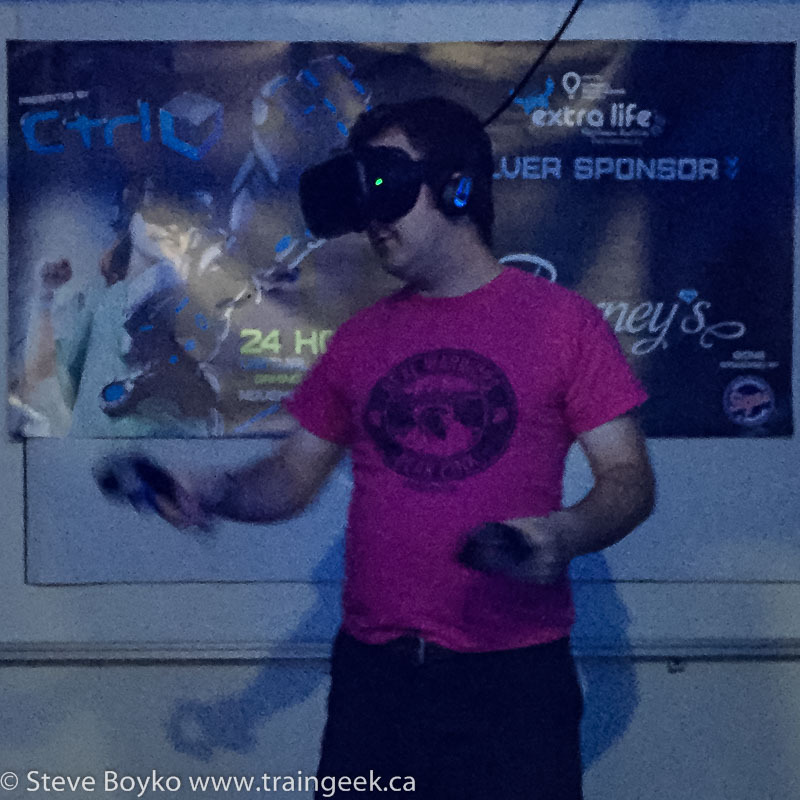 Afterward, we had ice cream, then Nick and I went to Ctrl-V, a virtual reality arcade. SO. MUCH. FUN. After some solo gaming, we teamed up to shoot zombies. It's hard to describe the experience. You have this big thing on your head that projects a 3D view - tethered to the ceiling so you don't strangle yourself - and you hold two wands that act as your hands. You can grasp things and pick them up, fire guns, turn door handles, and lots of other actions. When you walk, your "avatar" walks in the virtual world. It's quite an experience. Anyway, we had a lot of fun. It's pretty expensive at $25/hour so it's easy to run a big tab up, but we spent $75 for one shared hour and another hour for each of us. Much fun was had. I had hoped that Nick and I could chase the Ontario Southland Woodstock job on Thursday morning, but he had to do one last shift at work before leaving. I couldn't let the opportunity go, so I went solo to Salford in the morning to chase the train. I noted that there were a few changes to the power behind the shops from my visit the previous afternoon. The OSRX 1401 / 1594 pair was gone, and in its place were OSRX 1620 / 1400. Also, OSRX 378 and 383 were visible behind them. I parked off the road near the shop entrance and walked onto the property, camera clearly visible. There were a couple of crew standing in the open shop door and they greeted me. 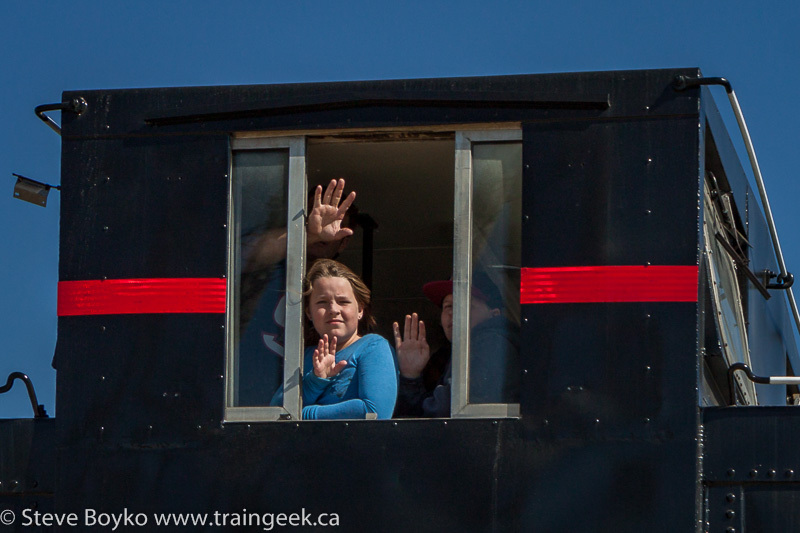 We chatted for a bit and they were very friendly and clearly used to railfans walking up to see their railway. 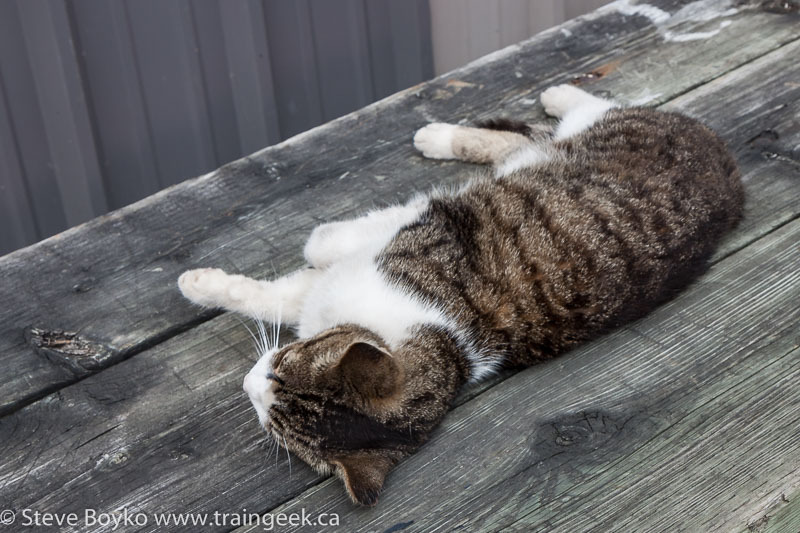 They pointed out "CJ" the shop cat, so I had to take a couple of photos. Apparently she has been in a few articles. The crew told me their plans for the morning. They were going to take 1620 and 1400 and run light to Ingersoll with 1620 leading, switch the small yard in Ingersoll, then go work the GM CAMI assembly plant (currently making the Chevrolet Equinox and the GMC Terrain). After that, they were heading to Woodstock to interchange with CP. The weather was pretty gray and it was forecast to rain. Not ideal photo weather but what can you do? A quick glance inside the shops showed Essex Terminal Railway 102 with hood doors open, and the OSR's third "F" unit, 6508, behind it. I understand 6508 is out of service at the moment, which is a shame as it is the prettiest of the three units in my opinion. After a few minutes, OSRX 1620 and 1400 came up to the side of the shop. They paused by the shop for a couple of minutes, then headed north toward Ingersoll. The going away shot was nice. I hopped in my car and headed to Ingersoll... but where, exactly? I've never been in Ingersoll. I did some scouting on Google Maps the night before, so I knew the general layout of the town, but I didn't know where the train would be. Once I arrived in the town, the first order of business was to find them. Both CN and Ontario Southland have track through Ingersoll. I drew a little map. So the units came up from bottom right to join the Ontario Southland St. Thomas subdivision. When I arrived, I wasn't sure if they had gone to the GM CAMI facility yet or not. I decided to go there first, but there was no action there, just a lot of autoracks. I drove back northeast along the track and spotted them just east of the junction of the Port Burwell and the St. Thomas subdivisions. I parked nearby and walked over in the growing rain, but they took off to the east! Back to the car... then I drove into downtown Ingersoll. I went all the way east out of Ingersoll to ensure they weren't there. Too far! I drove back into town and went down to their tracks downtown, but they weren't there. I did stumble across the VIA station and the ex-CN station on the CN Dundas subdivision. The VIA Rail station is the utilitarian one on the left, obviously.. I appreciate that an attempt was made to make it a little more attractive than a square box of a building. That sad station to the right was built by the Great Western Railway (GWR) - in 1886, I believe. The Great Western became part of the Grand Trunk Railway (GTR), which itself became part of the Canadian National Railways (CNR). Notice that the baggage / freight section was added on after this postcard's date. There's an "urbex" (urban exploration) video showing the exterior of the ex CN station. It looks like it is in the same shape as the Fredericton, NB station was when it was finally refurbished. There were calls in 2014 to do something about the station but I haven't found any reports since on any progress to refurbish or demolish the station. Oddly the station is not protected under the Heritage Railway Stations Protection Act like many old Canadian train stations are. I wonder why it wasn't protected? The CPR station was demolished in 1976. There's more information on Ingersoll's train stations here. 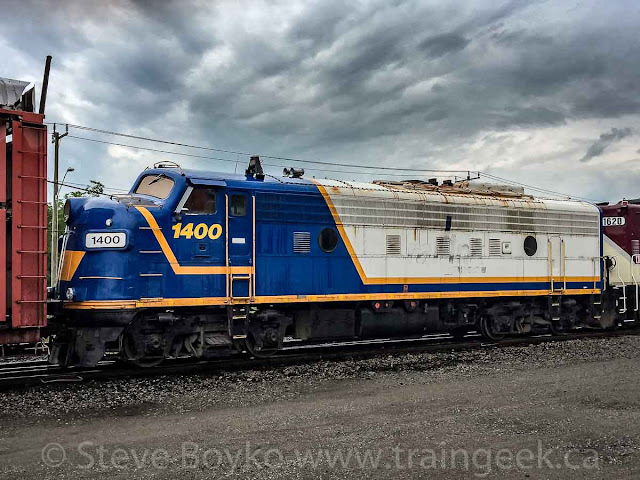 After grabbing a few photos of the stations, I went back to CAMI and found the locomotives pulling autoracks out of the facility. 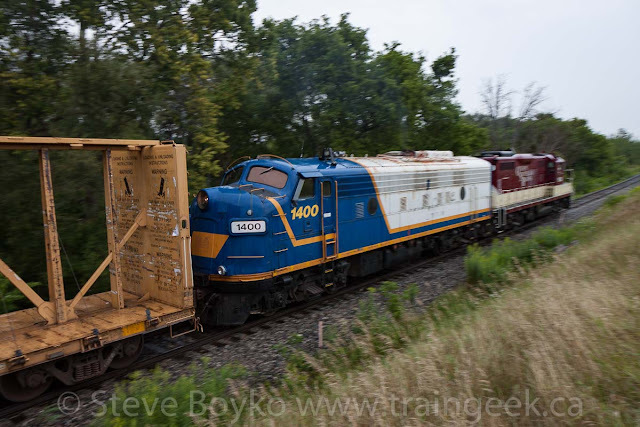 To be more accurate, I saw autoracks moving but never saw the locomotives there. I figured they were going to shuffle cars for a bit, but they just took off right away heading east toward Woodstock! I felt pretty dumb... stumbling around the town and never really seeing them. Well, no time to feel sorry for oneself... the chase was on. Fortunately highway 9 parallels the track between Ingersoll and Woodstock so there was no possibility of losing the train! I raced along highway 9 and grabbed a couple of roadside shots in the growing rain. I was down to f/8 and 1/80s shutter speed due to the low light from the cloudy sky. Back in the car and give 'er! In part 2 I posted photos and video of the chase to Woodstock, as well as switching operations in Woodstock itself... plus photos of the ex CP and CN train stations in Woodstock. Read on! PS - I will probably post the video of my morning with the Ontario Southland on my YouTube channel before I post here again. Why not subscribe to my channel to get it first? Movement on the Churchill Rail Line At Last?